Stock watch: How did the Seahawks grade out in their 27-24 opening-week defeat to the Broncos? There weren't many bright spots in the Seahawks' defeat to the Denver Broncos, but the rookie punter was — once again —something to cheer about. DENVER — The only number that ever really matters in a football game is the final score. And not that that one looked good for Seattle — a 27-24 loss to the Denver Broncos. But in some ways that looked better than a lot of the other numbers as the Seahawks were outgained 470-306, converted just 2 of 12 third downs, had 13 first downs to Denver’s 25, and had just one sack while allowing six. If not for three interceptions of Case Keenum, some of the other numbers might well have looked a lot worse. As it was, it’s hard to give the Seahawks too many passing grades on a day they lost to a team that was 5-11 a year ago and in a somewhat similar retooling phase of their own. Russell Wilson was in far from peak form. He was sacked six times and later admitted he was to blame for three of them by trying to use his legs to keep a play alive when he should have thrown the ball away. He also threw an interception in the third quarter that led to a Denver field goal, ran just twice for 5 yards and had a fumbled snap on the last possession that basically killed any faint hope of a rally. With so many new pieces around him, Wilson will need to be better. Not the day here the Seahawks would have hoped for. Chris Carson had one spectacular 24-yard run. But otherwise, the running game was fairly non-existent — and Carson also lost a fumble and dropped a pass. And it was a rough debut for first-round pick Rashaad Penny, who had just eight yards on seven carries. And take out Carson’s run and the Seahawks had just 40 yards on their other 15 attempts. Carson (3-28) and Penny (4-35) at least did show some good things receiving. The worst news here was the loss of Doug Baldwin to a knee injury in the first half. It also wasn’t great that the Seahawks appeared on some key occasions to have trouble getting open. Jaron Brown was just about invisible with his only catch coming on the final drive, and David Moore had just one target and no receptions. Brandon Marshall at least had a nice day, finishing with three receptions for 46 yards and a touchdown, though an offensive pass interference in the second quarter — which he said was a good call — negated a Seattle TD and forced the Seahawks to settle for a field goal. Dissly, Dissly, Dissly! 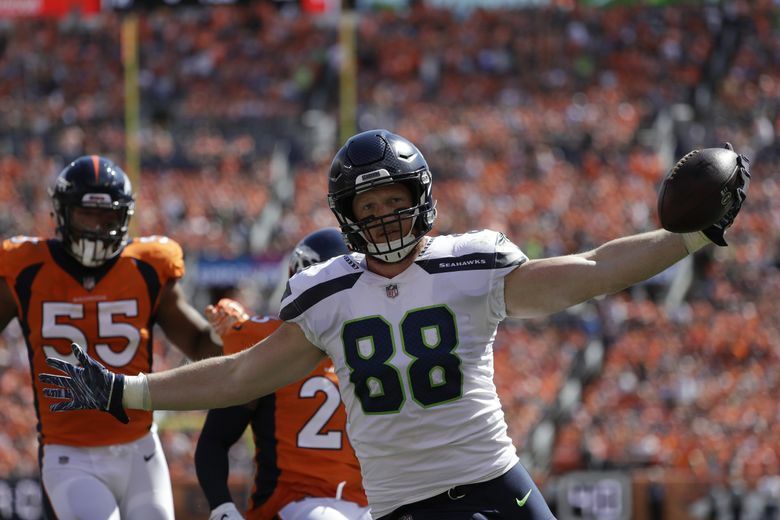 Will Dissly, the former UW Husky, was the breakout star of this one with his early receptions — his 81 yards on two catches in the first half were more yards than Jimmy Graham had in any one game all of last season. But Nick Vannett had just one catch for 11 yards, and the sacks and lack of rushing seem to indicate the Seahawks didn’t get the overall blocking they needed. Six sacks obviously looks really bad. But as Wilson admitted, he was largely to blame for three of them. Still, the Seahawks had their issues up front — Germain Ifedi will take a lot of blame but Von Miller was a tough matchup and he was hardly alone. Ethan Pocic seemed to have some struggles inside as well. And then the running game woes, which were far too reminiscent of the last two seasons. Seattle played the run pretty well in the middle of the game but looked worn down at the end. Or maybe as Frank Clark said, they just didn’t stay as disciplined there as they needed to. Whatever the case, when the game was on the line and the Seahawks needed the front seven to come through and stop Denver’s run, it couldn’t. And the pass rush was spotty throughout. Seattle had just one sack and five quarterback hits. Bobby Wagner helped key the run defense and the Seahawks stiffened after they made a subtle personnel change. Seattle had Austin Calitro playing weakside linebacker on obvious run downs and Shaquem Griffin entering on third downs after Seattle opened the game with Griffin playing on every down. Barkevious Mingo had three tackles but no QB hits. Boy, did Earl Thomas make a difference — the Broncos gained 119 yards on the 10 plays he sat out (an average of 11.9) and 351 on the 62 he played (an average of 5.6). Tre Flowers had some struggles but also hung in there. Given the circumstances, it could have been far worse. Bradley McDougald had two interceptions but Seattle’s run defense was lacking at key times in which you couldn’t help but wonder what Kam Chancellor would have done. A lot of good — Michael Dickson’s punting, solid coverage — and some bad — Sebastian Janikowski’s two misses on a field goal attempt in the first half and not much in the return game (Tyler Lockett had 11 yards on three punt returns and 39 on two kickoff returns). Dickson’s good ultimately outweighed the bad, though, with Denver having to navigate a lot of long fields. Denver’s drive starts after Seattle punts were its own 10, 2, 37, 6, 13 and 19. There were two obvious standouts for the Seahawks in this one, one on each side of the ball — rookie tight end Will Dissly and strong safety Bradley McDougald. Dissly had three receptions for 105 yards including a 15-yard TD in the first quarter that had coach Pete Carroll saying he was calling him “Ditka” on the sidelines — a reference to Hall of Fame tight end Mike Ditka. McDougald battled a sore knee to pick off two passes, one of which stopped a Denver drive at the Seattle 18 late in the first half, and the other of which led to a Seahawks touchdown.